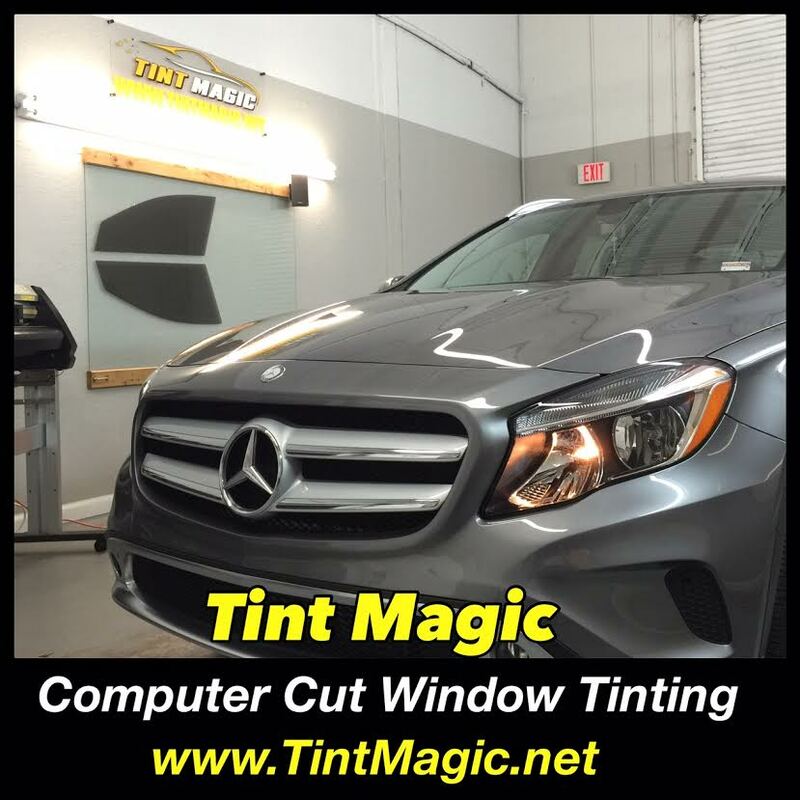 Mercedes Benz GLA250 at Tint Magic Window Tinting Coral Springs. We have applied Gold Package Window Tint 35% on two front windows and 18% in the rear windows with SunTek Lifetime Warranty for peeling , bubbling and fading. Call us for a free estimate! (954) 840-7883. We are located at 11344 Wiles Road Coral Springs, Fl 33076.
he GLA250 cute-ute has CLA250 roots: it’s basically the lifted version of the CLA250 sedan. Like the CLA, the GLA sports the 208-hp 2.0-liter turbo four and 258 lb-ft with front-drive and a seven-speed automatic. All-wheel drive is optional. The GLA’s cabin design, finishes, and features echo the CLA, but the back seat here is more realistic, as is cargo flexibility. Steering feedback is minimal, but the GLA is fun around town and feels more nimble than the CLA sedan. From the nose, the GLA looks fully Benz modern, featuring a blunt, upright prow, swept-back headlights, and the all-important emblem centered proudly in the two-bar grille. From the rear? It’s just a hatchback, one with massive, protruding taillights that look like symmetrical cybernetic boils. As with the B-Class Electric Drive the chrome bar meant to tie the taillamps together instead appears a bit like aftermarket kit. The rear is where this car’s otherwise handsome exterior terminates with a whimper.